This black and white photograph shows Albert McDonald Cole. A lawyer and a county attorney from Jackson County, Kansas. 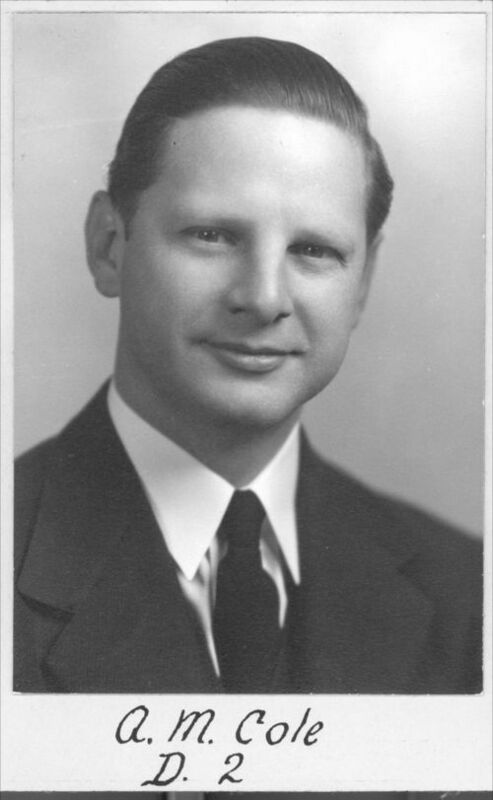 Cole began his political career, in 1941, when he was elected to the Kansas Senate as a representative for the counties of Atchison and Jackson. He served in the legislature until 1945 before successfully being elected to the U.S. House of Representatives from Kansas' first congressional district, (1945-1953). In his 1952 bid for re-election, Cole was narrowly defeated but the loss was attributed to his support for the construction of the Tuttle Creek Dam. After his career in Kansas politics came to a close, Cole later served during the Eisenhower adminsitration as Administrator of the Housing and Home Finance Agency (1953-1959). From 1959 to-1961, he served as vice president of Reynolds Aluminum Service Corp. and president of Reynolds Metals Development Corp.(1961-1967).